The common housefly is very fond of avocado. We have a couple of avocado trees in our garden, and avocados regularly fall from the tree if we are a bit late in harvesting the ripe ones. Every day during the peak harvesting season, I pick up a few that have fallen and splashed themselves to pieces, then deposit them into the trash bin. It seems a waste to simply throw away the fruit, but here in our neighborhood many folks have an avocado tree, or two, on their property, and it is virtually impossible to give the fruit away, much less sell it. So . . . the houseflies and ducks have tasty avocado snacks daily. 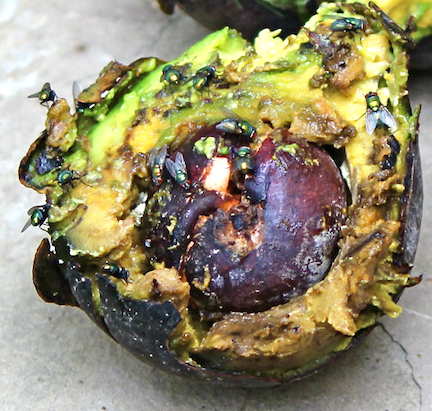 The ducks turn the avocados into eggs for us, and the flies become snacks for the garden spiders. The ducks also snack on the flies, when they can catch them. And, of course, we have plenty of avocados for salads and dips. Isn’t it wonderful how Mom ( Mother Nature, that is ) balances things out for all us critters to enjoy ? 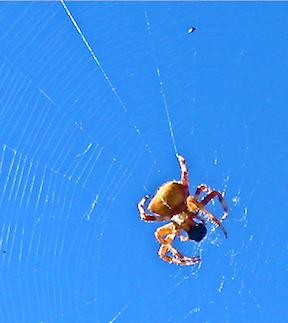 This entry was posted in Home and Garden and tagged avocado, ducks, garden spider, house-fly, housefly, mother nature. Bookmark the permalink.